“Two MCs and One DJ”. The classic structure of a HipHop crew, popularised through trios like Run DMC, is now rarely seen in a corporate rap culture dominated by individual artists accompanied by auto-tune and the familiar material clichés. 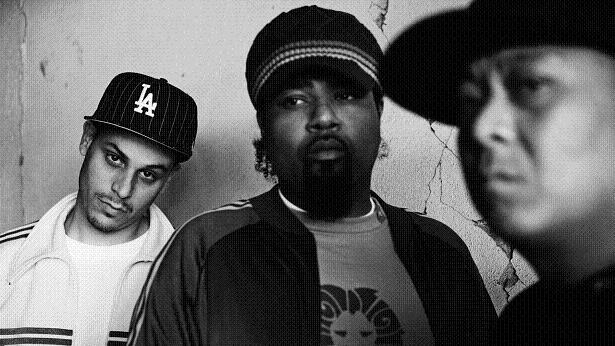 DJ Babu, Evidence and Iriscience, who make up the LA collective Dilated Peoples, formed back in 1992. The Westcoast crew still bring the rawness of early Hip Hop culture seamlessly into the 21st Century. The Islington Academy was, therefore, filled with both young and old, some middle aged stood towards the back nodding along in their work clothes, while the younger, perhaps looser shook their arms as the headline acts emerged hats down, hands high. The Microphones were clear, with Evidence and Iriscience keeping up the energy, delivering the trademark back-and-forth flows historically used by rap duos, but less popular in recent collaborations (such as the recent Jay-Z and Kanye West album). Although greater crowd participation, and a cheeky charisma many are familiar with when seeing live HipHop of this standard, would have improved the atmosphere, (aside from a short rant about Tony Blair by Iriscience) Dilated let the music do most of the talking. Favourites such as ‘Neighbourhood Watch’, ‘Live on Stage’ and the world-famous ‘Worst Comes to Worst’ hyped the already adoring crowd, and the new Evidence album, Cats and Dogs, with tracks produced by the likes of DJ Premier pleased both the dedicated Dilated followers, as well as every other Hiphop fan in the audience. The highlight of the show for many was the solo set by DJ Babu. The unassuming producer/DJ added an additional dimension to the Hiphop performance with a scratch interlude that rap gigs on their own can never match. The collective, which formed over two decades ago, have fused their sounds so tightly over the years that their performance as a single entity showcases a politicised Westcoast Hiphop often missing from rap music today.